Intel isn't actively porting Android to work on tablets based on the upcoming Atom chip code-named Clover Trail, which is purpose built for Microsoft's Windows 8, according to a source familiar with the company's plans. Initial tablets using Clover Trail will launch later this year, and will coincide with the release of Microsoft's Windows 8, which is also expected later this year. Intel has said 20 Clover Trail tablet designs are in the works, and the companies launching tablets will include Acer. Intel has worked closely with Microsoft to tune tablets with Clover Trail chips for Windows 8 OS, which has a touch user interface. A handful of Clover Trail tablets have been shown running Windows 8, but none have been shown running Android. Intel is a big backer of Android, but the source did not disclose what direction the company would take on Android OS for tablets. A prototype tablet with another Intel Atom chip code-named Medfield has been shown running Android, and Vizio is expected to use the chip in an upcoming tablet with a 10-inch screen, which is also expected to have the Android OS. The Medfield chip is also being used in smartphones from Lenovo, Lava International and Orange. Intel continues to work closely with Google to tune Android for Intel Inside smartphones, and Motorola Mobility, now a part of Google, will start selling x86 smartphones in the next few months. Intel is placing big bets on Clover Trail and Windows 8 to grow in the tablet market, where it has a minimal presence. Microsoft has announced Windows RT for tablets with ARM processors, which dominate the tablet market. Intel's first dedicated Atom chip for tablets, code-named Oak Trail, was launched last year and is being used in a few business tablets that run the Windows 7 OS. Apple's iPad rules the tablet market, and Microsoft's Windows 8 is being seen as a big threat to Google's Android OS. Though successful in smartphones, Android has failed to break Apple's dominance in tablets, tasting success only through a few tablets such as Google's Nexus 7 and Amazon's Kindle Fire. Some major device makers such as Acer and Asus, which currently offer Android tablets, have also announced Windows 8 tablet-PC hybrids with Intel's Ivy Bridge processors. An exception is Dell, which is putting its full weight behind Windows 8. Hewlett-Packard, which abandoned WebOS, said its next tablet will also be based on Windows 8. Lenovo has showed a ThinkPad tablet running on Windows 8. 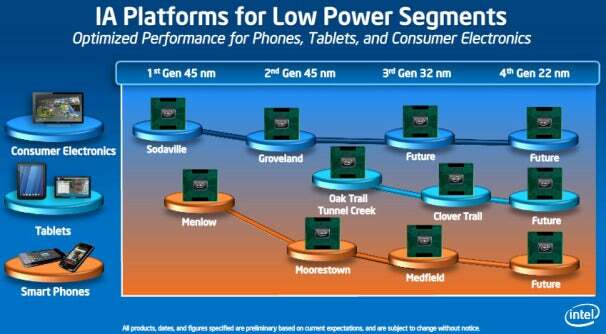 Intel is keeping its OS options open for mobile devices. The chip maker has said it would evaluate Windows Phone OS for smartphones, and is actively supporting Tizen OS, which is being developed in collaboration with Samsung and other companies.